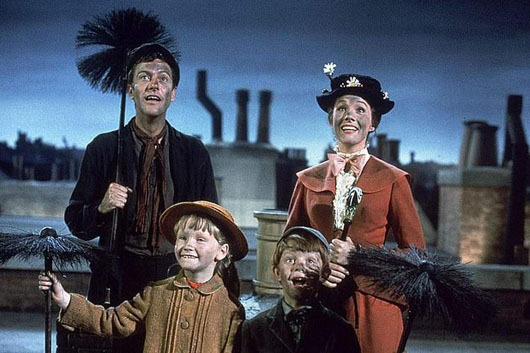 What’s brewing, according to Daniel Pollack-Pelzner, a professor of English/Gender Studies/Shakespeare at Linfield College in Oregon, is that Mary Poppins, played by Dame Julie Andrews, is racist. In a piece for The New York Times, Pollack-Pelzner takes Andrews to task for “blacking up” with soot while dancing with chimney sweeps in the iconic scene which features the classic song Step in Time. The professors writes: “When the magical nanny (played by Julie Andrews) accompanies her young charges, Michael and Jane Banks, up their chimney, her face gets covered in soot, but instead of wiping it off, she gamely powders her nose and cheeks even blacker. “This might seem like an innocuous comic scene if Travers’s novels didn’t associate chimney sweeps’ blackened faces with racial caricature. ‘Don’t touch me, you black heathen,’ a housemaid screams in ‘Mary Poppins Opens the Door’ (1943). “When the dark figures of the chimney sweeps Step in Time on a roof, a naval buffoon, Admiral Boom shouts, ‘We’re being attacked by Hottentots!’ and orders his cannon to be fired at the ‘cheeky devils’. Poppins fans suggested the professor may need a spoonful of sugar.